Explore local history, culture, and beer on Indy's most fun and unique drinking tour! Explore MASS AVE, Indy’s trendiest district! 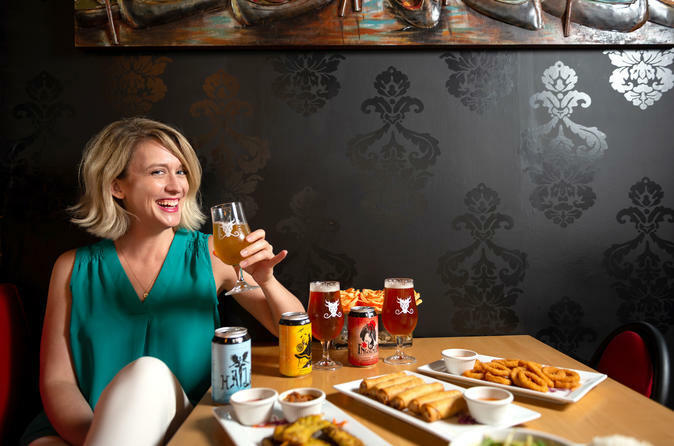 Enjoy generous beer-tasting samples and small plates of food! Discover the neighborhood’s heritage and cultural influence! Tour the historic Athenaeum which includes Indy’s oldest restaurant and traditional German Biergarten! Experience Indy like a local with your knowledgeable, beer-savvy guide! Tour Indy's trendiest district on the Indy Beer Mile while enjoying a taste and learn experience with generous beer-tasting samples and small plates of food at four local establishments. The tour begins at a local brewery renovated from a former Catholic church. Enjoy a Belgian style beer and the "Confessional IPA" at this popular spot while gathering a brief history of beer's early role in religion. Learn about the city's German heritage as you tour the historic Athenaeum, then stay for a beer at Indy's oldest restaurant and traditional German Biergarten. Next, visit a locally-owned Scottish pub and try this native Scotsman's homemade recipe for his mother's famous Scotch eggs! End the tour at a lively Irish watering hole and see if you can beat your tour guide during the Guinness challenge! This walking tour is guided by Amy Beers who is an Indianapolis local, experienced guide, and knowledgable beer enthusiast. Prost!